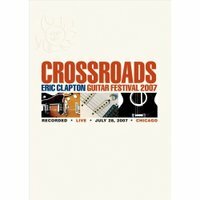 The DVD of the 2007 Crossroads Guitar Festival will be released Nov 20th. You can pre-order now from Amazon.com. See the tracklisting below. Great news Rich!! I can't wait. And it looks very affordable at Amazon. Can't wait! Couldn't get a ticket but it will be nice to see it in the comfort of my living room. Thanks for the info Rich.